Engineered Compressed Air Nozzles reduce noise and save energy by converting energy normally lost as pressure drop and noise into useful flow. RICHMND HILL, ONTARIO, CANADA, October 16, 2018 /EINPresswire.com/ — Nex Flow™ Air Products Corp. at https://www.nexflow.com have developed "the" most efficient compressed air operated air nozzles in a new patented design that provides the highest force/unit air consumption. Sizes available are small 4 mm, 5 mm and 6 mm versions and larger sizes in 1/4" and 1/2". The smaller nozzles are available in 316L stainless steel and Peek. The 14: and 1/2" versions are available in both cast zinc and 316L stainless steel materials. 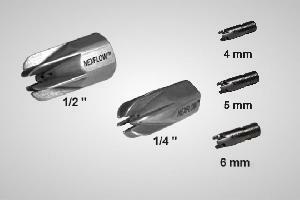 The Nex Flow™ Air Mag™ Air Nozzle (see https://www.nexflow.com/air-mag-air-nozzle/) unique, patented design focuses the air into a sharper laminar flow with the highest force per SCFM. This both reduces compressed air energy use and noise levels when compared to open pipe or jets. Even replacing competitive air nozzles will reduce compressed air energy costs along with providing low exhaust noise levels. This new design even outperforms nozzles using a so-called laval effect, but without the annoying whistle that may come with such designs. The Nex Flow™ Air Mag™ nozzle is designed so that the force at a particular pressure will be about the same as a competitive nozzle similar design. This makes it easy to compare and prove the superiority of the Nex Flow™ Air Mag™ nozzle by simply replacing the other nozzle and compare results. Just have a pressure regulator and gauge upstream of the nozzle, and, if possible a flow meter also. Have a weight scale to blow against or use it in your application. For each nozzle, adjust the pressure upstream to that it is the same for all nozzles tested. If you replace any competitive nozzle, you may have to cut back the pressure as you will get more force from the Nex Flow™ Air Mag™ nozzle. This is because the air consumption is “less” at any given pressure which also means less pressure drop in the line as the air flows out. So you end up with a bit more pressure and force. You can then cut back the pressure if not needed, thereby reducing compressed air use even more. If you have a flow meter, all nozzles can be tested comparatively on actual air consumption. Alternatively,just try the various nozzles and you will normally find the Nex Flow™ Air Mag™ nozzle to perform better due to its more efficient design.